Even before Frank Miller put his personal stamp on Daredevil in the late 1970s and introduced many of the elements that made Daredevil one of the darkest books in mainstream superhero history, Daredevil was a character born of tragedy. His radar-sense superpowers were born of the accident that took his sight. He was abandoned by his mother and lost his father to violence. Some of his love interests were killed by costumed super-villains. Some of his love interests WERE costumed super-villains. His secret identity was exposed to the public on three separate occasions, requiring that he deal with it by creating a fake twin brother, fabricating a second separate legal identity, and then by simply denying everything and threatening libel suits. At one point or another he’s lost his job, his home, his mind – even his soul after a brief stint being demonically possessed. Yet despite it all, Matt Murdock perseveres. When approached about creating a new Daredevil series for Marvel Comics, veteran writer Mark Waid reportedly had one condition. He did not want to start the book over by introducing a new girlfriend for Matt Murdock who would turn out to be a ninja assassin with a hereto untold tale of woe seeking revenge. He would not bring back The Kingpin with an entirely new scheme to ruin Matt Murdock’s life. He refused to add to the festering dung heap of tragedy that has been Matt Murdock’s life for the past three decades. What he would do, instead, is make the book fun again. From the opening chapter of this book, we know that this is a Daredevil not seen since the days of Stan Lee. Crashing a Mafia princess’s wedding to thwart a kidnapping, dodging bullets even as he steals a kiss from the bride – this Daredevil is a hero from the same school as Douglas Fairbanks and Errol Flynn. He is bold. He is gleeful. He laughs in the face of danger. And under Waid’s pen he is glorious and truly worthy of the title The Man Without Fear. Waid quickly establishes the world of Matt Murdock for those new to the characters. A brilliant lawyer by day and vigilante by night, Matt Murdock and his best friend and legal partner Franklin “Foggy” Nelson have recently revamped their law firm into a legal-aid clinic where they advise their clients on how to best represent themselves in court. This step proved necessary since Matt’s alleged superhero identity, while not publicly proven to anyone’s satisfaction, has caused enough mistrials to make it impossible for him to directly represent anyone in court. Waid also introduces a new foe/love interest in the form of Assistant District Attorney Kirsten McDuffie, who is determined to prove Matt Murdock and Daredevil are one and the same even as she finds herself falling for the idealistic lawyer. Waid’s scripts are backed by some equally excellent artwork, provided by two separate creative teams with very different ways of showing us the world through Matt Murdock’s eyes. The first three chapters are illustrated by penciler Paolo Rivera and inker Joe Rivera. They show us the world from Matt’s viewpoint through a series of black backgrounds overlain with red lines highlighting the objects as Matt “sees” them. The last three chapters are illustrated by Marcos Martin, who takes a more minimalist approach to depicting Matt Murdock’s radar sight. Concentric circles overlay single-color silhouettes of the objects and people around Daredevil. Both methods are effective and the normal artwork is laid out with equal skill and detail. 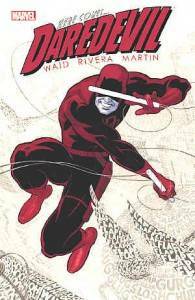 Daredevil is one of those rare books that proves capable of pleasing both long-time fans and newbies alike. There’s nothing in the book that would be objectionable for the book’s target audience of 12 and up. Indeed, this series should be considered a must-have for any superhero fan’s comic collection or young adult library collection.